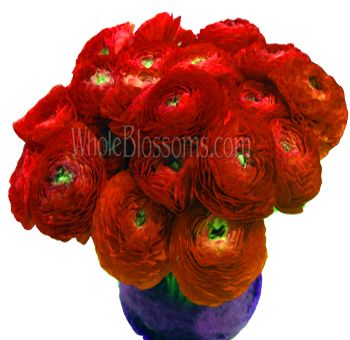 Ranunculus is a great idea if you choose to do-it-yourself. They are delivered fresh, overnight to your doorstep. We offer a beautiful assortment of varieties that are guaranteed to brighten up any room. Choose from a medley of striking colors, or order a single bright color. All of our flowers are at their highest level for the maximum vase-life. They are available year round. Please consider that their size at the time of harvest is generally smaller during the winter months and larger during the spring and summer. These almost too perfect to be real blossoms have layers on layers of silky petals that come in bright colors almost like that of a paint box. They are not seen much in gardens at home. 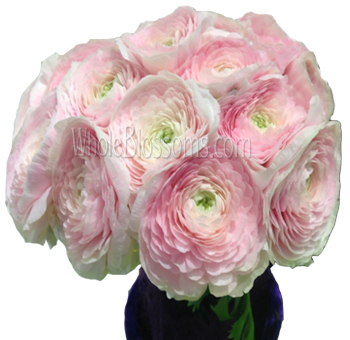 But, the exquisite rose-like flowers of ranunculus are very popular and in demand in the cut flower industry. You might see them in wedding décor especially in the hands of the bride.They make excellent additions to any bouquet and floral arrangements. Ranunculus is from a genus of about five hundred species of flowering plans in the family of Ranunculaceae.The members of this genus include buttercups, spearworts, and crowfoots. The beauty of the plant lies completely in the petals. They are highly lustrous especially the yellow colored species.They owe it to a special type of color mechanism that makes the upper part of the petal very smooth almost causing a mirror-like reflection. A lot of pollinating insects are attracted by this. It also regulates the temperature of the flower’s reproductive organs. They usually flower in the spring, but the flowers are available all through summer since the plant grows as opportunistic colonizers. These species are popular in horticulture as cut flowers and cultivated for their bright and beautiful blooms. 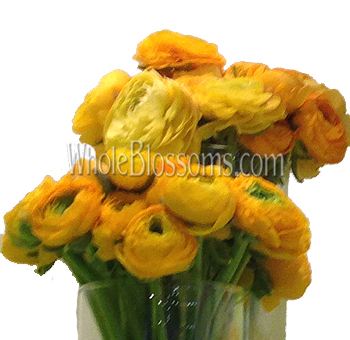 Ranunculus flowers are the full blooms that are very similar to roses and are members of the buttercup family. They come in bright colors and are generally very popular when it comes to floral settings, arrangements, and décor. 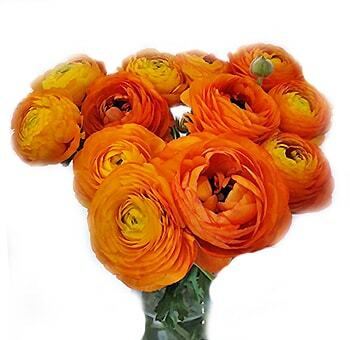 The beauty of this flower lies in its shiny mirror-like petals that are extremely beautiful and attractive to the eye, making the Ranunculus an all time favorite. If you decide to use these flowers, you will be glad to know that they can be used almost everywhere. These full blooms can make your wedding altar down to your bridal bouquet. As centerpieces they are unique and brilliant, stunning on their own and magnificently complimenting other blooms like peonies, Calla lilies, and even the exotic pincushion or king protea. That's why it's best if you purchase them in bulk. Running around town from florist to florist is also not very cost effective at all. Whether you're an event planner, floral designer or a do it yourself bride knowing a good wholesaler that can provide Ranunculus in bulk can be a serious blessing. You will be able to purchase quantity at a reasonable price and also have the availability of many colors on demand. 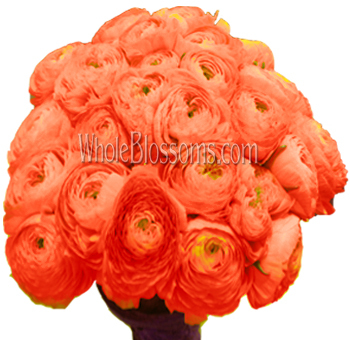 Orange and pink Ranunculus flowers are especially beautiful and unique and are largely incorporated into the coral and pink themes of weddings. 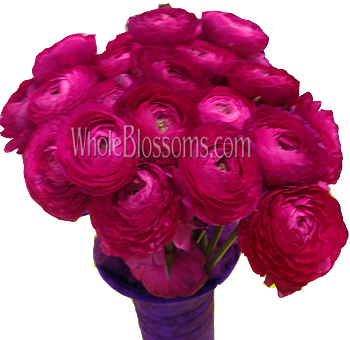 The Ranunculus flower with its especially rose shaped bloom, and lustrous petals are easily amongst the favorite blooms of people that have come across them. They are just as widely popular in the cut flower trade as peonies, Calla lilies and even tulips making them a common sight in bouquets. These flowers have soft feathery petals and blooms that come in a lot of shades, hues, and colors. It may seem like summer brides have the best choices when it comes to flowers but the little-kept secret of the ranunculus is that they are also available between January and May making them easily accessible for brides planning to tie the knot during that season. It's obviously more affordable, and it's prettiest when in season. But they are most likely available throughout the year. The charming flower has increasingly become the bridal staple and does well on its own as well as a paired with other component art flowers. This versatile bloom should be on your radar by now. 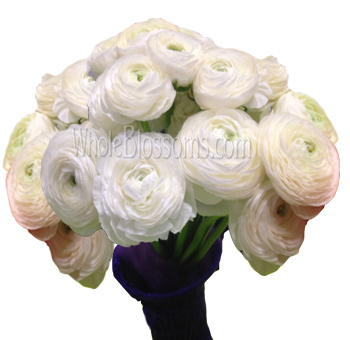 Ranunculus white flowers are especially gorgeous when paired with garden roses and fillers. There's a difference of size and texture, but otherwise, it can create a very beautiful composite wedding bouquet. If you’re trying to find the perfect way to add Ranunculus flowers in your wedding let me inform you that they can be used everywhere. You’ll be wanting to include them in all your floral arrangements and not just the bridal bouquet. The best place to buy them in bulk from is online wholesalers. 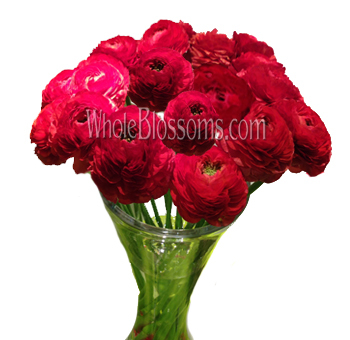 You can easily order online Ranunculus flowers for sale. But Make sure that you place the order from an esteemed or trusted source. 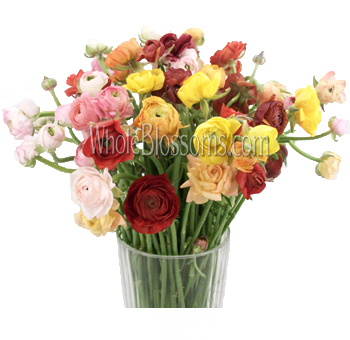 A renowned name in the wholesale cut flower business would be Whole Blossoms. They are an incredibly trusted vendor that can cater to all your flower needs. They even deliver right to your doorstep and have a 24/7 hour delivery service system especially for event planners, floral designers and even do it your self-brides. This is a serious luxury for events planned in urgency. Moreover purchasing the flowers like this in bulk directly from a wholesaler can help you save some big bucks.